Will a new international bank challenge American global financial hegemony? Well, at recent meetings in Brazil, the five BRICS countries–that’s Brazil, Russia, India, China, and South Africa–have created a new international bank called the NDB or New Development Bank, and it’s been given $50 billion in initial capital. The BRICS bank works on an equal-share voting basis, with each of the five signatories contributing $10 billion. The capital base is used to finance infrastructure and, quote, sustainable development projects in BRICS countries initially, but other low- and middle-income countries will be able to buy in and apply for funding. BRICS countries have also created a $100 billion contingency reserve arrangement (CRA), meant to provide additional liquidity protection to member countries during balance-of-payments problems and other financial shocks. The CRA, unlike the pool of contributing capital to the BRICS bank, which is equally shared, is being funded 41 percent by China, 18 percent by Brazil, India, and Russia, and 5 percent from South Africa. The new bank is being described as a challenge to the IMF and the World Bank, that is, a challenge to American global financial power. But is it, as Vijay Prashad wrote, neoliberalism with southern characteristics? Now joining us to discuss all of this first of all, in Toronto, is Dr. Leo Panitch. He’s the Canada research chair in comparative political economy and a distinguished researcher professor of political science at York University. He’s the author of The Making of Global Capitalism: The Political Economy of American Empire. And also joining us is Michael Hudson. Michael, are you in New York? MICHAEL HUDSON, PROF. ECONOMICS, UMKC: Yes, I am. JAY: You’re in New York. Michael, joining us from New York, is a distinguished research professor of economics at the University of Missouri-Kansas City. Newest book is two newest books: The Bubble and Beyond and Finance Capitalism and Its Discontents. LEO PANITCH, PROF. POLITICAL SCIENCE, YORK UNIV. : Glad to be here, Paul. JAY: So, Michael, kick us off. How significant a development is this? HUDSON: I think it’s much more significant than any of the press has said. The press treats it almost as if, well, they’re very small, and what do these countries have to do. 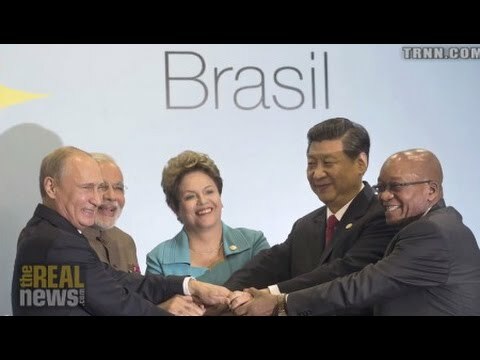 Think of the BRICS as doing on the government level what Occupy Wall Street has been advocating. When they say a new development bank, they don’t mean they want to be like the World Bank or the IMF. They want a different kind of development. But also it’s not only a development bank, but it’s the $100 billion currency scheme. They are trying to–they’ve been driven into a mutual economic defense alliance by the U.S. sanctions against Russia, by the threats against China, not letting it invest in the U.S. on national security grounds. They’ve forced other countries really into let us do whatever we want with you, there is no alternative, and we’re going to do to you what we did to Ireland and Greece, and that’s it. Well, basically what the BRICS are saying in their new bank and their clearing house is, yes, there is an alternative. We don’t have to be like neoliberalism. Their critique of the World Bank and the IMF isn’t that they’re not given big enough quotas; it’s they disagree with the whole philosophy of the World Bank and the IMF that is subsidizing economic dependency, food dependency, and basically anti-labor parties that result in budget deficits, that then governments are told, well, in order to finance your foreign debt and your budget deficit, you have to sell off your water, your natural resources, your privatization. The BRICS banks, they’re not going to go to the member countries and saying, you have to sell off your water supply and raise prices in order to pay us. JAY: Right. Let me bring Leo in here. So, Leo, what do you make of Michael’s take? How significant is all this? PANITCH: Well, I think it’s very significant, and it is designed to give these large developing capitalist countries more room for maneuver vis-à-vis the American state and the European Central Bank and the IMF and the World Bank. But I think the significance he’s attaching to it is remarkably overblown. There’s no evidence that their purposes are indeed not to apply conditionality to loans. There’s loads of evidence with the nonoperationability of the Bank of the South, which was the bank created in Latin America that the Brazilians–which have made it nonoperational by insisting it be a very conventional development bank which in fact goes to the markets and therefore is constrained by the markets in terms of interest rates to be charged, etc., conditionalities, as opposed to Bolivia and Venezuela that wanted it to operate on very different, not market principles. The Brazilians don’t want that and don’t want it for the new bank. And I don’t think it’s just a matter of the Brazilians. The Chinese don’t want it either. There’s a much deeper factor why it’s not so significant, although it does give them some room for maneuver in their operations. But the main reason is that it’s embedded in countries, even with China, that don’t have the very, very, very–as Michael knows very well–deep financial markets that is needed for this kind of bank to play that kind of role. JAY: Okay. Leo, hang on one second. That’s sort of a second point. Let Michael respond to your first point. Your first point is that this is not something against a neoliberal strategy; this is some independent maneuver of countries that do work within a neoliberal strategy. So what do you make of that? PANITCH: Well, let me just to emphasize that look at who was just elected as the government of India. Look at the extent to which even the Workers Party has been keen to integrate further into global capitalism. Let’s look at the way in which China has just begun to remove some of its financial restriction. And let’s look at what the ANC now represents. So, sure, they want more room for maneuver, but within the framework of buying into capitalist globalization and being extremely dependent on it. JAY: Okay, Michael, you can respond. HUDSON: Neoliberalism is not simply an economic philosophy. It’s interwoven with American foreign policy. Take the case of Ireland when it bailed out the banks a few years ago. Europe was coming to an agreement, and the IMF, with Ireland to write down the debts until Tim Geithner called from the Treasury and said, wait a minute, you can’t write down the debts, because American banks have written credit default insurance, and American banks will take a bath because we’ve be that Ireland will pay; so don’t bail it out. So Europe and Ireland both surrendered and said, okay, we’re going to follow you. Same thing in Greece. The IMF even got into an argument with the E.U., saying, you can’t be that bad against Greece, you can’t really force it into so deep a recession. The U.S. got on the phone and said, wait a minute, the American banks have written default insurance. You can’t write it down. If you do, we’re all going to have to pay through the nose, and we’re not going to take the loss. So at issue isn’t bank profits or capitalism; it’s specifically the United States. And it’s the United States that has the veto on the IMF, the United States that has the veto on the World Bank. And basically I think what’s motivated the BRICS, these countries together, is they have one thing in common: they’re all under attack by the United States economically, and in Russia’s case militarily, with sanctions. And so what Russia is trying to do is say, look, right now the United States can make a threat against us. They can say, if you don’t do what we want militarily or politically or economically, we can block your currency payments, we can block the banks, and we can strangle you. So what Putin in his press conference for the BRICS said was the state was the distinguishing feature is we’re not putting in dollars into these banks, we’re putting in our own currencies, and the loans will be made in our own currencies. And the fact is that governments can create as much of their own currency as they want. They don’t have to go to the market in principle. JAY: Okay, let Leo jump in. PANITCH: Well, Michael, if you were advising them they might, although there would there would be very, very heavy, as you would admit, sacrifices that they then would have to bear. But these are states that reflect their class structures, these are states that like the United States reflect powerful forces within it. And what you’re proposing is not something that any of the dominant capitalists in any of these countries, whether, you know, foreign mining companies in South Africa or ambitious Chinese multinationals, want to happen. Moreover, the notion that they’re not interested in convertibility into American dollars–I mean those particular domestic capitalists in those countries–is absurd. Sure, Putin can spout off all he wants about the ludicrous notion of the ruble as a international reserve currency with none of the infrastructural capacity to make it such, but this is not a practical alternative. That’s not to say it isn’t designed to do is you say, to give them some both rhetorical and maybe institutional room for maneuver. But let’s not overblow this, for heaven’s sake. HUDSON: Okay, it’s not–there was no attempt by Russia to make the ruble a convertible currency. What Russia wants to do is to nominate its trade in rubles, just as China’s denominating its trade in yuan, so that the United States cannot use its banks to do what they’ve done in the case of Argentina and say, we can block any payment going through the banking system just like after the Shah was overthrown in Iran, Iran tried to pay its foreign debts, the new regime, and Chase Manhattan acted on behalf of the U.S. government and blocked Iran’s payment, forcing it into default, causing a crisis. Now, Iran is an observer member of the Shanghai Cooperation Organization that’s part of the BRICS, and the whole attempt is to make an alternative, is to avoid the dollar. It’s not to make the ruble an international currency; it’s to get free of the dollar and hence free of the kind of sanctions that the United States has just escalated against Russia today, free of the monetary sanctions, and free of the ability of the U.S. to use the dollarized system as a political solution. PANITCH: I know that’s their objective. I don’t disagree with you that that’s their objective. I think we if we’re assessing the significance of this, I think we have to assess the likelihood of this. We have to assess what the most powerful forces inside their own countries wanted this respect, how many eggs they’re going to put in this basket, what is the capacity of these countries to operate outside of international financial markets in which the dollar–by which we really mean very powerful financial institutions headquartered in the West with the states that represent them–of continuing to exist. JAY: Michael, I want to just refocus this, ’cause the first part of the argument was whether the strategic objective of this bank is actually anti-neoliberal, ’cause it seems to me there’s two different issues here. If they want to have more room for their own sovereign interests within this whole neoliberal financial system, that’s one thing. It’s another thing to say that they want that, plus they want that to avoid things like structural readjustments and all the various privatizations and attack on Social Security net and lowering wages. I mean, it seemed to me at the beginning you were suggesting they want to go against those kinds of policies, and Leo asked or said there’s no evidence of that. So what’s the evidence of that? HUDSON: –with a view towards raising living standards–. PANITCH: Michael, no country has privatized more, no ruling class has privatized more than the oligarchy around Putin. They’ve taken that country’s wealth and put it in their back pockets. And even if it is officially still owned by the states, it’s in their back pockets. Let’s not turn Putin and his cronies into the vanguard of a new socialist society, for heaven’s sake. HUDSON: I cannot argue with that, Leo. You’re absolutely right. PANITCH: It’s very important we not do this. HUDSON: The question is: what’s the evidence that there is a break from the neoliberalism? I mean, another break that they’ve all said is, well, neoliberalism really means the dollar standard and it means lending money in dollars for imports. For instance, one of the things that the BRICS conference said was, we will be lending money in domestic currency. Now, that’s very important, because the World Bank doesn’t lend money in domestic currency. That means it doesn’t lend money for land reform, for agriculture, for all of the expenses that are met domestically for labor to develop agriculture, to develop industry. It only lends dollars, basically to buy U.S. exports of infrastructure, U.S. engineering exports–and European. So making loans in domestic currencies for domestic development–for instance, China would love to see Latin America, instead of producing hard cash plantation crops, it would love to see it produce wheat and food. This would have a byproduct: it could feed itself, as Argentina’s now doing, and it could export. So a shift [crosstalk] financing to wheat away from other things would be a big change. PANITCH: Again, I don’t know what evidence you have that China has not played an enormously massive role in producing export-oriented monocultures in South America. In fact, the Landless People’s Movement, whose main theme is that, you know, we have such a massive population, we need a diversified agriculture to feed it, it doesn’t target any longer the United States as imposing that upon Brazil, for heaven’s sake! Brazil, sure, is looking for room for maneuver in terms of diversifying its exports by concentrating on monocultures, as is Argentina with soy, to be sent to China. I mean, I don’t think that one should look at these ruling classes in the Global South with rose-colored glasses, even though we want to be able to recognize the extent to which the American state is indeed the imperial state governing, superintending this global capitalism, and we need to, of course, be critical of it. But that doesn’t mean we need to be naive about what these other states are. HUDSON: No, what I said is that the exports that China is trying to develop–and you’re absolutely right; of course it’s promoting exports to itself–are different from the kind of development exports the United States wants. Their economies are so asymmetrical, the United States doesn’t want food exports, because it wants the world to become dependent on American grain and American agriculture. That’s been the basis of American foreign policy since World War II. So just shifting to grain and to foodgrains, as opposed to other cash crops, is something that at least in emergency the countries will be able to feed themselves, which they’re not able to do under under the current system. JAY: Okay. Leo, let’s dig in a little further just how significant, this. Now, the size of the economies we’re talking about are massive. My understanding is South-to-South trade is now larger than North-to-South trade by $2 trillion, and that’s about a quarter of global trade. So is the potential here of these countries seeking to build some kind of a more independent financial structure significant? I mean, you said earlier there’s a deeper issue here, and I kind of cut you off. What’s the deeper significance here? PANITCH: Well, obviously, these are very important developing capitalist countries. Unfortunately, they’re developing capitalist countries rather than developing socialist countries. That’s what’s happened even with the Workers Party in Brazil and the ANC and the South African Communist Party. All the more so it now happened with the right-wing-led India. And it’s happening with a vengeance with a Communist Party that is very venally turning its elite into a capitalist class. So it’s a developing capitalist country. That’s significant historically. It certainly undermines the old notion that capitalism was underdeveloping the Global South. The people used to blame the United States for that. We now see that there’s a rapid development, which the United States has encouraged through free-trade and neoliberalism, very much so. That said, it’ll be much more difficult to integrate those countries within the American empire than it was to integrate the former imperial countries of Europe and Japan, for reasons that have to do with the lack of military occupation, that have to do with differences in religion, culture, history, language, etc. That’s certainly true and it’s significant. But the important thing that’s going on now that’s much, much more significant is the participation of these countries in guaranteeing, in the wake of this crisis through the G20 and through their very active cooperation in this, that the crisis would not lead to the re-imposition of tariff protection, it would not lead to the imposition of and extension of capital controls, all of the things that occurred during the depression in the 1930s when there was a breakdown of capitalist globalization. These countries are opposed to this. Now, insofar as we might see a break from Russia under pressure from the United States, that would take much more the form of a right-wing nationalism led by this Russian oligarchy than it would be something progressive, unfortunately, given the balance of forces in Russia. But the main thing is that these countries are not getting off the capitalist globalization bandwagon. They’re looking for more room for maneuver within it. JAY: Okay. So, Michael, if I understand, your main argument is–in some ways it’s not that different, in some respects, from what Leo was saying. You’re not saying they’re getting off the whole capitalist bandwagon. What you’re saying they’re doing is buying themselves a little more room in terms of their foreign policy. HUDSON: There is a very broad range over what they can do. And if you look at what is the most likely of common denominator, it’s exactly what Leo said. The common denominator is it’s their capitalists against the U.S. capitalists, it’s their saying, what can we do to be free of the U.S. banks and Wall Street and the City of London and the financial extractive loans. At least the neoliberal plans today have gone beyond trying to finance infrastructure development. The financial system in the West is almost entirely extractive now, not productive. The capitalist class in the countries that Leo’s mentioned want at least some bank to do some productive loans that they can benefit from, rather than having the U.S. come in and grab everything for itself like a privatization on behalf of the U.S. You see this kind of fight going on in Greece right now, where the eurozone said Greece has to privatize its natural resources to pay the debt. Half the privatization last year was to be the sale of its gas rights. HUDSON: Well, it turned out that Gazprom [incompr.] And Europe said, never mind; don’t sell them. We don’t want Russia. Only us, not Russia. PANITCH: –one of the largest and more–. China. PANITCH: So, I’m sorry, I don’t see the world in terms of competition amongst the capitalist classes of the world in the sense you’re speaking of. I think there is a very deep integration on the part of the leading capitalists in these countries, including the domestic ones, into globalization. I think that’s true of Vale in Brazil. JAY: That’s the world’s largest iron ore company. PANITCH: That’s the world’s largest iron ore company, which, sure, is competing with other iron ore companies. But it doesn’t see itself as aligned against the American bourgeoisie or the American capitalist class. This is not right. And moreover, I think that these capitalist classes very much want access to the deep financial markets of London and New York. They don’t want to leave them; they want to be part of them. They want access to them. Indeed, they’ve been floating bond us in those markets–dangerously, in terms of volatility. So I think–and it has to be said the reason they do so is that their financial markets, their bond markets, even the European bond market relative to the London/New York access, remain extremely weak, extremely vulnerable. So it’s also a matter of where the deep institutional strength of capitalism is. I would make one other point. I don’t think that finance, even Wall Street and London–the City of London finance is merely parasitic. I think it facilitates, it underwrites, it’s very important in terms of hedging for all of the integrated production that goes on between China and the United States, between South Africa and Europe. This plays a functional role for all these value chains. Of course there’s loads of speculation in this, but it means that industry is linked up with this speculation. These aren’t separated compartments. And you can’t unscramble them. HUDSON: I see that I’m emphasizing the geopolitical much more than you of nobody’s talking about Brazil and other countries not interacting with the London and New York money markets. What they don’t want to do is to have the U.S. government and U.S. banks act as a threat, a threat against their countries. And of course they’re trying to keep their–have other options apart from being tied into the U.S. as a system of control. They want to break free of U.S. control, basically, and European control is a satellite of the United States. PANITCH: Yeah. But since politics and economics aren’t so easily separated, their continuing interest and increased interest in being linked economically and financially means that the American state, given its superintending role of Wall Street and the City of London, will continue to have power vis-à-vis them. They would like to, as we’ve agreed, they’d like to have more room for maneuver in the face of that enormous power of the American Empire, but they are not interested in breaking from it. JAY: Okay, guys, this is a wonderful beginning to a very complicated subject, and we are going to pick this up again. So I’d like to just say to you our viewers, if you have questions you’d like me to ask, ’cause we’ll ask both these gentlemen to come back and carry on this discussion, below the video make your comment, or you can just write to contact (at) therealnews (dot) com, or you can go @therealnews on Twitter, send in your questions and comments, and we will pose them to our guests. Leo, Michael, thank you very much for joining us.